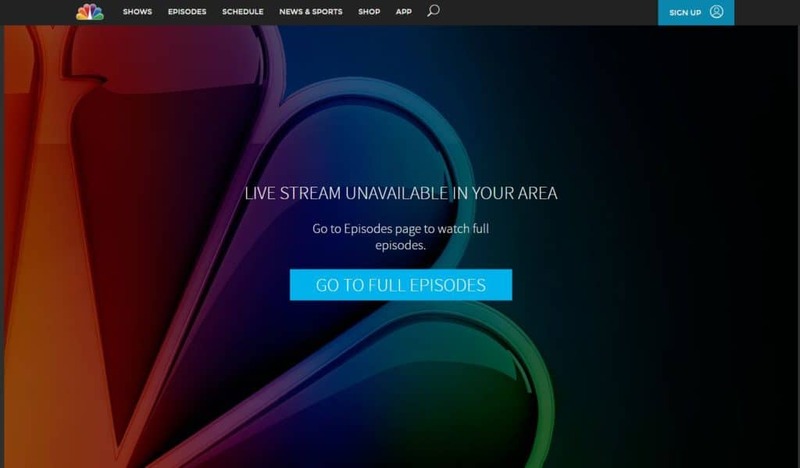 NBC is a very popular channel, but its online content can only be viewed from within the US. There is a workaround, however. If you’d like to watch from Australia, the UK, or anywhere else overseas (outside the US), a Virtual Private Network (VPN) will allow you to do so. ExpressVPN The one to beat. Hosts super-fast servers throughout the US that are great for streaming. Unblocks NBC from anywhere along with most other popular streaming shows. 30-day money back guarantee has you covered. NordVPN Budget choice with a multitude of servers for reliable connections and decent speeds. Unblocks NBC and more. CyberGhost Great value provider with some of the fastest streaming servers that we have tested. Easy to use apps are great VPN novices. IPVanish Look no further if you are a Kodi user. Reliable connections for streaming. PrivateVPN Newest provider on this list with a growing network of servers that can unblock most popular sites. Good streaming speeds. With 29 high-speed servers across the US, ExpressVPN allows you to watch HD content without any lag, stuttering or buffering. Better yet, it’s capable of unblocking a vast selection of popular streaming services including Netflix, Amazon Prime Video, Hulu, and of course, NBC. This service uses 256-bit encryption with perfect forward secrecy and provides DNS leak protection to ensure your browsing history remains secure. If your connection to the VPN is lost, ExpressVPN’s kill switch will activate, preventing you from browsing without protection. As this service keeps no logs, accepts bitcoin payments, and has a second, Tor-accessible site, it’s ideal for those who put privacy first. ExpressVPN has apps for MacOS, iOS, Windows, Android, and Linux. Some wireless routers are also supported for manual configuration. BEST VPN FOR NBC:ExpressVPN is our #1 choice. A blazing fast and reliable choice which unblocks NBC and all major streaming services while abroad including Hulu, Netflix and Amazon Prime. Great security and privacy features and keeps no logs. Try it risk-free with the 30-day money back guarantee. NordVPN is a popular choice for streaming thanks to its extensive server network and high speeds. All of its servers are optimized for HD streaming, and it can unblock all the most popular services including Netflix, BBC iPlayer, and HBO. Up to six connections are permitted per account so you can protect all of your devices at once. This VPN doesn’t log any of your information and comes with an application-specific kill switch to keep you safe should your connection drop. It has DNS leak protection, anti-malware, and ad-blocking features built in. Plus its 256-bit encryption is considered effectively uncrackable. This VPN offers Android, iOS, MacOS, and Windows apps. Selected routers and Linux-based systems like the Raspberry Pi are also supported with manual installation required. BEST BUDGET VPN:NordVPN is a great value choice. A good all-rounder that performs well with NBC while abroad. Strong security features and allows up to 6 devices to be used simultaneously from one account. Includes a 30-day money back guarantee. CyberGhost makes staying safe online as simple as possible. While you can choose a specific server, you can also choose one suited to a specific task like torrenting safely, unblocking specific sites, or staying anonymous online. With a dedicated option for unblocking NBC, CyberGhost is an obvious choice. While this service is easy for novices to use, it comes with several options for advanced users. These include a kill switch, forced HTTPS, an ad-blocker, and anti-malware features. With 256-bit encryption, no logs of your activities, and protection against port forwarding, IPv6, and DNS leaks, CyberGhost keeps your browsing habits private at all times. This provider has dedicated apps for MacOS, Windows, Android, and iOS. Manual configuration is needed for Linux-based systems and supported network routers. GREAT VALUE:CyberGhost is easy to use. A well priced solid performer. Good at unblocking NBC but can struggle with other streaming sites. Comes with a 45-day money back guarantee. IPVanish has a vast, self-owned network of servers spread across the world. There are more than 400 such servers in the US, and as IPVanish provides fast speeds, you’ll be able to watch NBC’s content without any lag or noticeable buffering. IPVanish can unblock numerous streaming services including CW TV, HBO, and PBS. IPVanish doesn’t keep logs of your activities and comes with several additional security features like LAN traffic blocking, a kill switch, OpenVPN obfuscation, and periodic IP address switching. Given that five simultaneous connections are allowed, this service is great for protecting all of your most commonly used devices. IPVanish has apps for Windows, Android, iOS, and MacOS, and Amazon Firestick and Fire TV. Linux platforms and selected routers are supported but require manual installation. Although PrivateVPN only has ten US servers, it manages to provide connections that are fast enough to stream HD video without any issues. It can unblock popular services like Netflix, NBC, and Hulu. With up to six connections allowed at once, you can watch from whichever device you prefer. This service keeps no logs and protects your traffic with 256-bit encryption. There’s protection against DNS and IPv6 leaks, as well as an optional kill switch. PrivateVPN offers 24/7 live customer support, and its staff can remotely connect to your device to help fix any issues. PrivateVPN offers dedicated Windows, MacOS, Android, and iOS apps. It can be manually installed on Linux systems and a selection of wireless routers. GREAT FOR SPEED:PrivateVPN is consistently reliable. Good for unblocking NBC and general purpose use. Speeds were surprisingly good at this end of the market. Could do with having more servers and lacks 24/7 support. 30-day money back guarantee. Can I use a free VPN to watch NBC? Free VPNs can be an appealing prospect, but we recommend avoiding them for several reasons. First and foremost, free VPNs often lack the network infrastructure required to deal with high numbers of users. This means you’re more likely to experience random disconnections or stuttering, low-resolution video, especially around peak times. You might ask yourself how free VPNs can afford to stay in business. Because they can’t charge you directly, they’ve had to find other ways to generate income. These methods range from injecting ads into the sites you visit to tracking your activities after disconnection and selling the details to third parties without your knowledge. In some cases, free VPNs actually make your system less secure. Some install malware, some don’t encrypt your data at all, and we’ve even seen free VPNs sell their users’ bandwidth to be used with botnets. To keep your data safe, we recommend using a reputable VPN service with a track record of protecting users’ privacy. Why can’t I watch the NBC live stream? You might have noticed that while your VPN allows you to watch on-demand content from NBC, you still can’t watch the live stream. This is because NBC requires users to sign in with their US cable provider’s details before granting access to live streamed content. Is there a way to bypass this? The answer is yes and no. 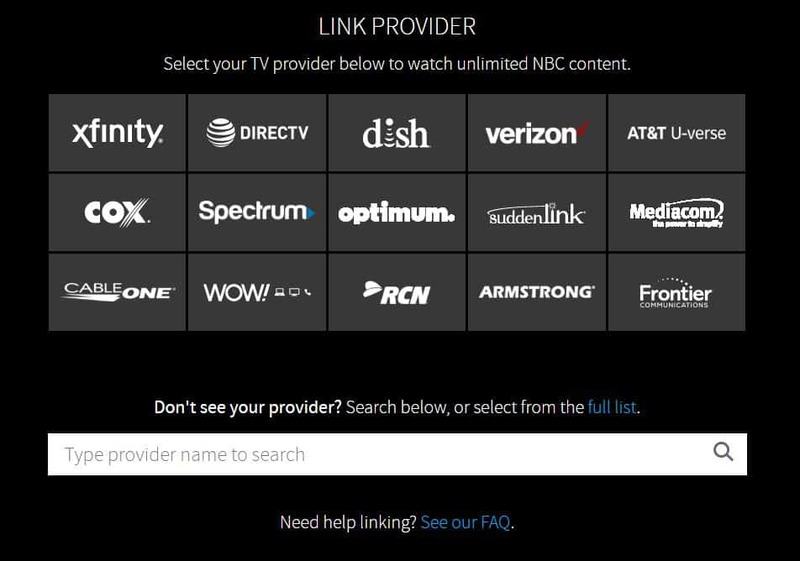 A cable subscription is mandatory on the NBC website for live streams, so you can’t watch the stream there. However, there are several streaming services that include NBC and cost less than a regular cable subscription. Many of these services offer free trial periods too, so if you only want to watch NBC live occasionally, you don’t have to pay a cent. Sling TV – $25 per month; offers a seven-day trial. Hulu – $39.99 per month; offers a seven-day trial. YouTube TV – $40 per month; offers a seven-day trial. On-demand only in certain areas. Fubo TV – $19.99 for the first month, $44.99 thereafter; offers a seven-day trial. It should be noted that while DIRECTV is commonly recommended, its channel list says that “To get a local or regional sports network, your billing address must match a local market, and your device must be in that location.” This effectively rules it out as an option for viewers overseas. What can I watch on NBC?